South County is a sprawling, rolling expanse of rural and semi rural lands in southern Nevada County, CA, just north of the Bear River and extending up to the bottom edge of Alta Sierra. By the official maps of the Nevada County Association of Realtors, the area I’m calling South County also includes most of the areas called McCourtney and the southern portion of the area called Grass Valley (not to be confused with the town of Grass Valley which is also in the area of Grass Valley, but not in the part of the area of Grass Valley that I am calling South County heh heh). It does not include Lake of the Pines which is inside of it, but not part of it, being a concentrated, private gated community, wherein dwell some of the most literate and high-class citizens of Nevada County such as, for instance, me. South County is pretty big; I’d guess it at between 100 and 120 square miles; it’s kinda hard to say because every one of its edges is squirmy. The area is characterized by rolling hills, green in the winter rains and then golden the rest of the year, Golden hills? Hmmmm, now why does that sound familiar? 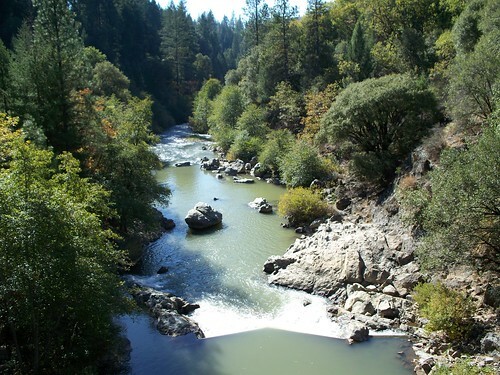 Here you can find some of the best farm and pasture land in Nevada county. The water is generally reliable and not too deep. The area is criss-crossed with creeks and polka-dotted with ponds and small lakes. In 2009 about 70 homes were sold in South County, all but three on at least 1 and 1/2 acres. In fact, 5 acres is the usual minimum sized parcel in the area. About a dozen pieces of raw land were sold, all between 5 and 35 acres at an average cost of about $16,000 an acre. Now before you start getting locked in on that figure, let me remind you that figuring price per acre is a complicated calculation with a lot of variables, not the least of which is experience. That’s why we don’t much like flat land and city slicker appraisers coming out here to estimate land value based on statistical prices per acre. Damned silly, that’s what that is. This morning I was driving though South County on the way to the dump. Some folks call it The McCourtney Transfer Station (hmph!). A surprise June rain had just freshened up the air. As we (me and my yeller dog, Dharma) came up over a rise, I could see, there, just beyond the next ridge, the Sutter Buttes. The Buttes are forty miles away, but they looked so clear and close I could butter them if I had a long knife. And some butter. Which I didn’t have. Either one.